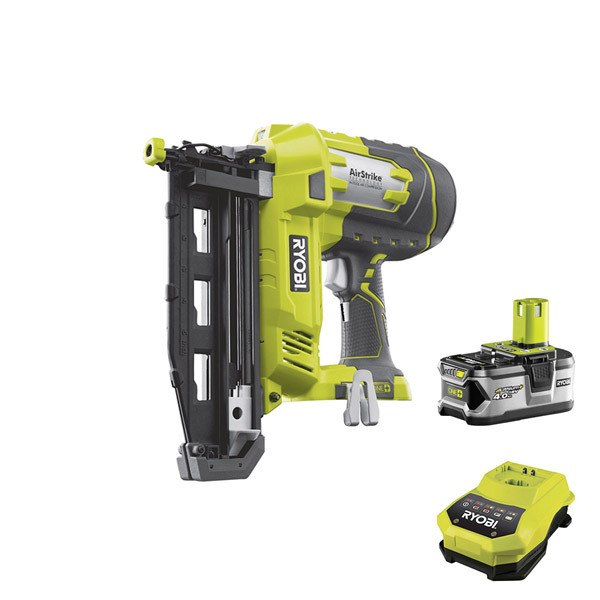 Avoid the need for a noisy compressor, annoying air hose or costly gas canisters with the 18v Cordless 16G Nailer. Able to fire out 16G (1.6mm) nails between 19 and 65mm long with two firing modes geared more towards precision and speed, it can fire up to 1000 50mm nails into pine. Tool less jam release and depth of drive adjustment allows easy removal of clear nails and the proper setting of nail heads too. The AirStrike technology provides cordless convenience, eliminating the need for a noisy compressor, bulky hose or those expensive gas cartridges. It fires 16 gauge(1.6mm) nails from 19 to 65mm long, the two firing modes allow for full sequential for fantastic precision firing and then the 2nd mode contact actuation enabling rapid fastening. The built in Grip light system turns on the LED to light the way as soon as your grip is placed on the handle. Tool less depth of drive adjustment helps protect the work surface and allows proper setting of nail heads. Dry fire lock out prevents the tool working without nails loaded. Tool less jam release for easy removal of clear nails. Low nail indicator shows clearly when it is time to re load.